You would assume, that the Doctor Who Restoration Team (DWRT); who have spent the last 20 years -remastering the Who back catalogue, were a specialist team set up by the BBC. You’d be quite wrong. 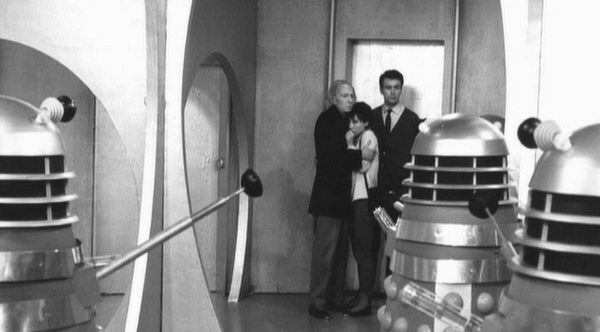 Infact, DWRT began life as a bunch of Doctor Who fans, working in the Television industry. Around 1992, they combined forces and persuaded the BBC to fund a one-off experiment. To restore a black and white Third Doctor adventure, to colour. They did this by perfecting the technique of combining a fuzzy colour video copy, over a high resolution 16mm black and white image. The result, was DWRT’s first restored adventure; The Daemons. Courtesy of ZegTheindestrucible – Youtube. Earlier attempts in combining black & white and colour tapes had produced positive results. So impressed with this endeavour, the BBC Archives and BBC Video provided further funding and DWRT began work on the rest of the Third Doctor catalogue. It was during this process, that the DWRT began experiment with software to help repair damaged and missing visual and audio sequences, from adventures. It became the DWRT team’s motto, that they only use software to return the adventure to it’s original state and never – as tempting as it was. To replace dodgy special effects of the time. The basic GE3 Questech Charisma video effects unit, which created the colour effects for Top Of The Pops was used. Followed by the much superior, digital software package; Quantel. Which was able to digitally “draw in” missing elements, within scenes. The output of this dual colourising and cleanup, was the VHS remastered Pertwee adventures; Terror of the Autons, Doctor Who and the Silurians and The Ambassadors of Death. The process continued throughout the rest of the 90’s, cumulating in a sizable number of the post-Pertwee years being released on VHS. It was around 1999, that the BBC planned to show a series of previously remastered Pertwee adventures. As part of a weekly run on BBC2. By this time, the DWRT had also taken receipt of a new Philips SDC-2000 ‘Spirit’ Datacine which was a state-of-the-art CCD film scanner (of it’s era). The prints were then rescanned on digital videotape, including the high quality 16mm filmed Spearhead From Space (later released as the only blu-ray – in the series). Sound mixes were cleaned up, by splicing better quality mixes from various sources. With technology moving on, the decision was then made to go back over all of the film stock – some original and some remastered, to restore it all to digital grade. This work was carried out using Pogle Platinum and DVNR-1000 applications. Later advancements, throughout the noughties; included the development of “Vidfire”. Software capable of digitally restoring the missing frames and produce a smoother video-style presentation. Courtesy of Ian Taylor – Youtube. DWRT even backtracked (somewhat) on their original pledge to never over-digitise the remastered Who and began “fixing” certain episodes. The original untouched version was always presented alongside this “special edition”, though. The DWRT had always strived to source and recover missing adventures, by using their industry and fan contacts. This accumulated in the 2013 re-discovery of previously missing Troughton stories; the incomplete The Web Of Fear and the complete The Enemy Of The World – found in a Nigerian TV studio. For the still missing adventures, DWRT decided to only restore adventures for eventual release; were the majority of original material survived. The remaining missing footage, was recreated as a web cartoon, featuring the original audio (which by-and-large survives for every missing episode). This accumulated in a number of additional DVD releases of previously partially missing adventures; The Moonbase, The Tenth Planet and The Reign Of Terror – to name but a few. Along with the Blu-ray remastered release of Spearhead From Space, DWRT fell quiet; for the first time in 20 years. There job seemingly complete – for now. Rumours are currently rife of a full blu-ray remastering of the back-catalogue, using the available footage to create (an as near to) full HD presentation. As is possible, with the source material. Of course, DWRT are still waiting for more discoveries of missing Hartnell and Troughton adventures; so that they may weave their restoration magic. So far, no more missing Who’s have surfaced.